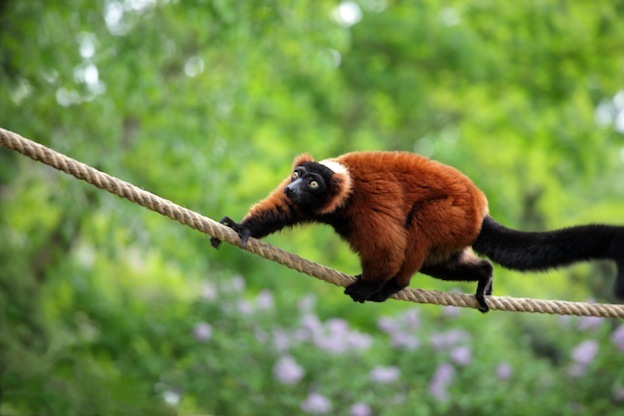 Red ruffed lemurs are one of the larger and quadrupedal among the lemur species. This prosimian primate is found in Madagascar. Size – Body length including tail is 45 inches (113cm). They are sexually dimorphic, females are larger than males. Weight – They weigh between 7.3 and 7.9lbs (3.3 and 3.6kg). Pelage – They have black fur on the head, stomach, feet, tail, and the insides of the legs; the ruff area of its body is red rust in color. There is a white patch on the back of the neck; rare white markings may also be seen on the mouth and feet. They live at elevations up to 3,300 ft (1,006 m) in the deciduous tropical forests of peninsular Madagascar. The red ruffed lemur is found in the primary forests remaining in the Masoala Peninsula and the area just north of Bay of Antongil in Madagascar. Being an arboreal creature, they prefer spending most of their time at the crowns of larger and taller trees throughout the year. A strikingly clean animal, they spend a considerable duration socially grooming themselves with their toothcombs and the claw of their second toe of their hind foot. They are diurnal in nature, staying busy during the daytime foraging for food or grooming. They live in matriarchal social organizations with groups of up to 2-16. Groups consisting of up to 32 individuals have also been seen in the wild. Red ruffed lemurs forage for food in large groups during the wet season when it is available in plenty; however when it is scarce in the dry season they split up into smaller groups, and sometimes even individually to look for food. 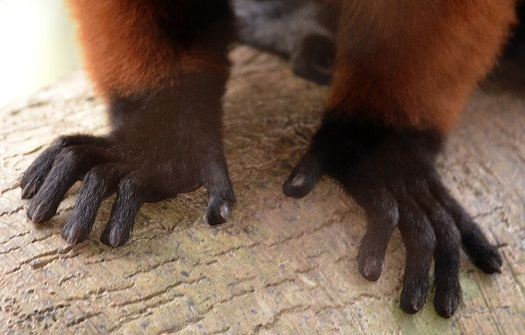 Age of sexual maturity for red ruffed lemurs is 2 years and they start to conceive at 3. Males are mostly polygamous, although some studies have found monogamous pairs. They mate during the months of May and July. Infants are born after a gestation period of around 102-106 days during the months of September and October, as the wet season during this period ensures sufficient food availability for the offspring. 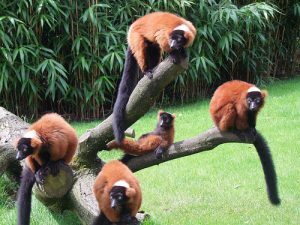 Although the average litter size for the red ruffed lemur is 2-3, there have been instances where 6 offspring have been birthed. 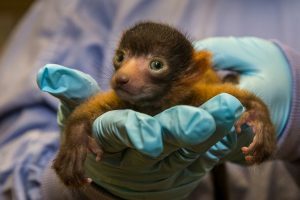 A baby red ruffed lemur is born with eyesight and fur. They are immobile at birth, a condition that urges the mother to build a nest up to 70 feet above the ground. Mothers can nurse up to 6 infants at a time. They are weaned at around 4 months. Given the relatively small gestation period, the ruffs of the newborn are not well developed. Most newborns do not live out their juvenile months as the mortality rate is rather high at about 65%, owing to the injuries sustained from falling to the forest floor from the tree-tops. They live for around 15 to 20 years in the wild, and in captivity up to 25 years. They are one of the most ‘talkative’ of the non-human primates. They use low grunts, cackling roars, gurgling sounds and shrieks to warn each other of impending dangers. 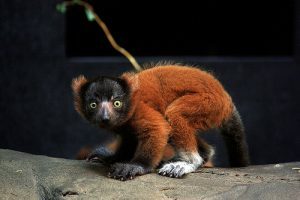 12 different vocalizations have been observed at a lemur sanctuary in North Carolina, each having its distinct meaning to the red ruffed lemur. Scent marking is also an important and much-used mode of communication between groups. 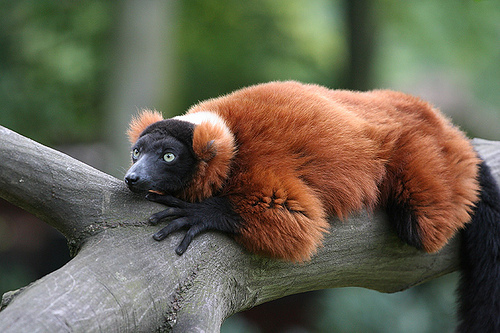 The diet of red ruffed lemurs consists primarily of fruits. They also eat nectar and pollen. During the dry season, they also ingest leaves and seeds. Since primarily frugivorous, the teeth of the red ruffed lemurs have been designed in such a way that helps to optimize their meal. The thick coat of fur on their bodies allows them to keep themselves warm during the rainy and winter seasons of their range. Toothcombs are formed when the lower incisor teeth grow slightly spaced and at an angle from their root. Their prehensile tails act as a warning tool when they feel threatened as well as for balancing itself while moving from one tree to another. They have scent glands present on their rump which help one group to identify the other. 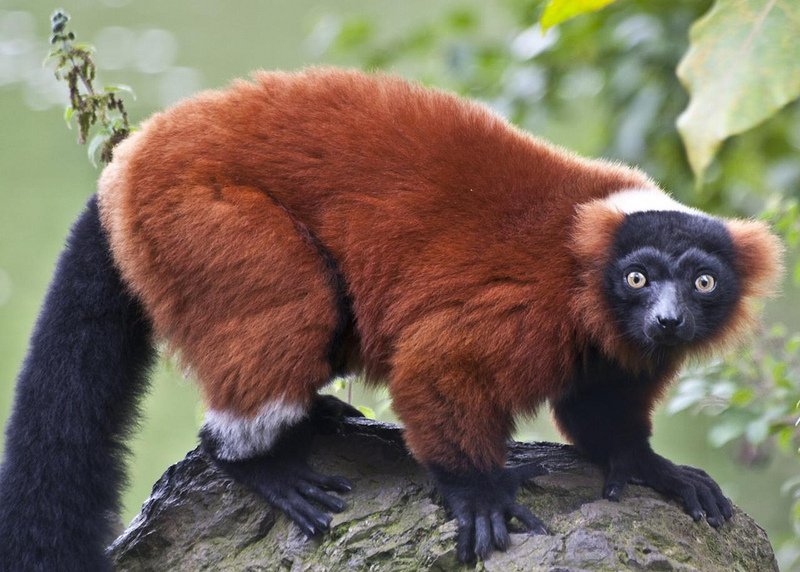 The few predators who dine on red ruffed lemurs are boa constrictors, hawks, and fossa. 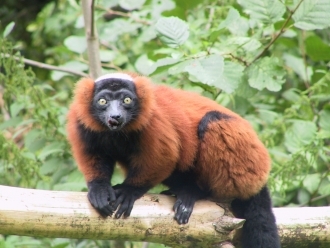 The IUCN Red List has categorized the red ruffed lemur as ‘Critically Endangered’. Conservationists have estimated that about 10,000 red ruffed lemurs remain in the wild and about 590 in captivity, putting the total number of individuals at an approximate 10,600. The reasons behind the decline of the red ruffed lemurs in the wild have been accredited mainly to loss of habitat stemming from logging, mining and cyclones. The creature is also captured abundantly because of its popularity in the black market as exotic pets. Though the ranges of the red ruffed and black and white lemurs don’t overlap, they can understand each other’s communication rather well. They do not interact with each other in the wild, however. 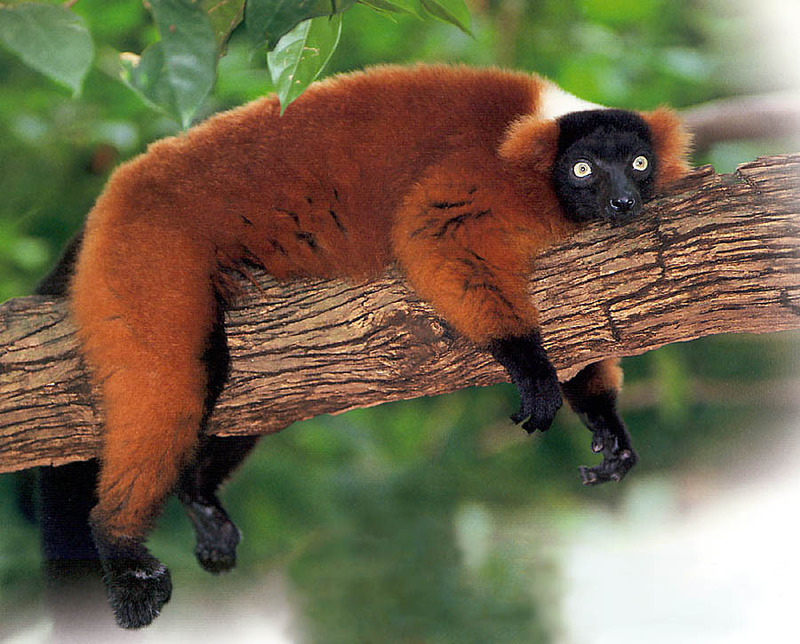 The red ruffed lemur is an important pollinator for certain plants of the Madagascan rainforests. A female red ruffed lemur at the Smithsonian’s National Zoo was treated with enrichment therapy to help her deal with the loss of her mate. Their mode of locomotion includes hurling themselves from the branch of one tree, flinging across the air and crashing onto the branch of another, a treat to watch for the human eye.